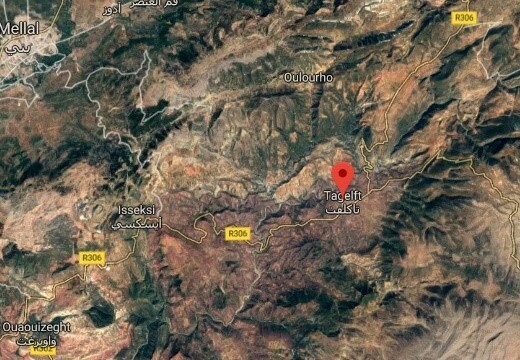 As part of my field visits to HAF’s partners and beneficiaries, I had the opportunity to see and speak to teachers from two schools who are hoping to undertake planting initiatives in January, one in the High Atlas mountain community of Tagelft, the other in the flatter commune of Bouchane. Although these schools were talked about in a previous blog post, their stories, hopes and plans for these trees were so profound and heartfelt that I felt that they should be told in more detail. When one travels through the High Atlas, an immediate observation is the bareness of the slopes, the lack of trees, the exposure of the soil to the elements. Removal of vegetation for firewood or for agriculture, the overgrazing of steep slopes by sheep and goats has led to out-of-control soil erosion, and is a crucial problem in this region. The absence of trees and other stabilising vegetation can lead to increased risks of landslides and flooding, both of which pose major threats not only to human life, but to livelihoods and infrastructure. 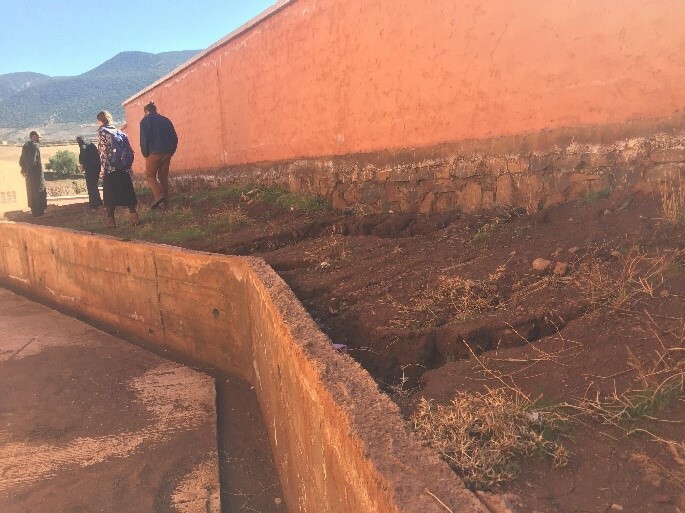 The remote mountain community of Tagelft is hoping to start combatting this problem by commencing a tree-planting project in both its Lycée and Middle Schools, which are frequented by children from 5 local rural communities. 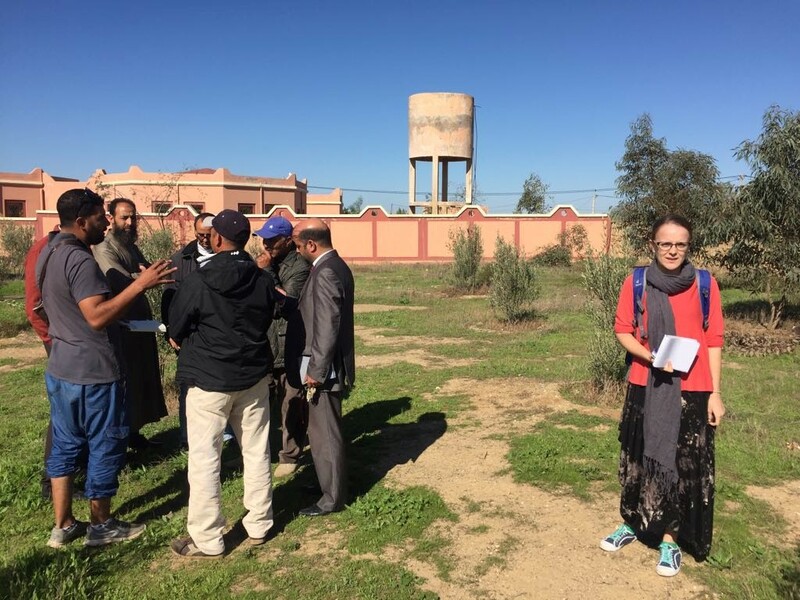 After observation, it was determined that the sites could host in excess of 500 income-generating trees, including olive, orange and fig, provided by HAF, in combination with forest trees, provided freely by the Moroccan High Commission of Waters and Forests. Fruit-tree seedlings would then be sold to local farmers at a symbolic price, to help supplement their incomes and instigate a culture of tree-planting in the region. 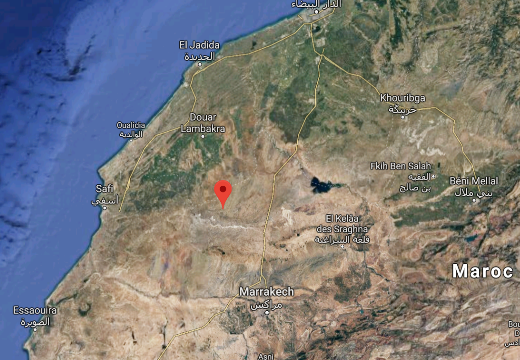 Other beneficial outcomes of this would be the stabilisation of eroding soils, bringing back biodiversity to Tagelft and combatting monocultures, as well as contributing to the promotion of economic prosperity and food security in the High Atlas. It will also provide the schools the opportunity to deliver workshops on environmental education, engaging and raising awareness of the importance of trees for mountain communities and the negative effects of deforestation. The teachers emphasised that the children would be given responsibility for taking care of the seedlings, led by their Environmental Clubs, which will help to improve the children’s organisation, leadership and motivation skills. However, on asking further questions, it became clear that for this community, the trees are more than just an economic venture or a symbolic environmental act. The schools want to improve the learning environments and provide positive educational spaces for their children, to boost productivity and to help motivate them to attend their classes. Not only this, but a “more beautiful” school is hoped to attract more teachers to the Tagelft area. The beneficial impact of trees and green spaces on the children’s mental health, as well as the cooling effect of vegetation in making temperatures in classrooms more comfortable in summer were also discussed. 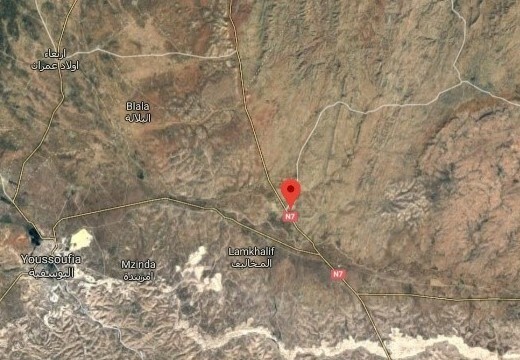 It is clear that the income generated from this project, in co-operation with the High Atlas Foundation, will make a big difference for these schools. 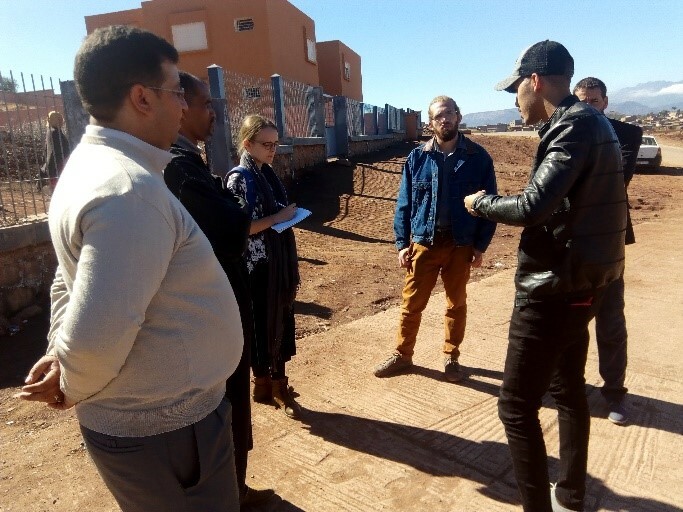 Tagelft Lycée’s principal hoped that in future, the extra money would go towards building a well for the school’s water supply, solar panels to provide the classrooms with electricity, and importantly, to provide extra income that is independent from the Delegation for Education’s funding. In contrast to Tagelft, the small town of Bouchane finds itself in much flatter, more arid country. What they do share however, is a lack of trees and vegetational cover, similarly caused by excessive land clearing and cattle grazing in the past. Currently educating 1102 students, Bouchane school is a previous beneficiary of HAF projects. 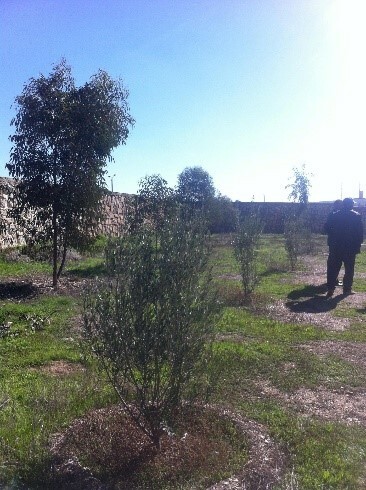 In 2014, HAF helped the school to plant 300 olive, pomegranate and lemon trees as well as herbaceous and medicinal shrubs. It now wants to expand its project by starting up a pilot modern tree nursery for the region, which would be equipped with a greenhouse and with water-saving measures. The school’s water reservoir would be connected with the greenhouse to provide drip-feed irrigation for the seedlings. There is also ample space to expand the nursery, if the project succeeds as hoped. The school has the first three years of the nursery mapped out already: in year one, each student will be given two trees to plant in their own homes or communities. 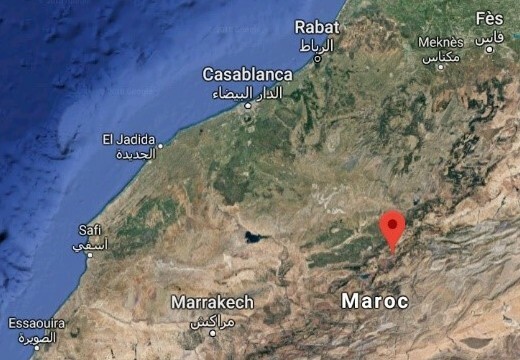 In the second year, plants would be distributed to all schools in the region, and finally in the nursery’s third year, they hope to provide their trees to those who need them across all Morocco. The school decided to focus on planting primarily olive and carob trees, as they are both suitable for the dry soils of the province, but also generate good income. This money will then be used to reinvest in other projects which will benefit the school, and give them independence from the state education budget. There was also some discussion of planting forest-tree species after this three-year period. HAF will support Bouchane’s project by providing trainings, funding and follow-up checks of the trees to ensure that they are healthy. One teacher spoke of his idea within the project, which would see each of the three school tiers take ownership over one of the three tree strips in the nursery and would provide a competition for which tier could take best care of their trees. The overall nursery would be overseen by the school’s Environmental Club. He was excited at the prospect of increasing the young people’s awareness of their environment, and to give them a sense of ownership in the nursery. He also spoke of giving a prize to the student with the best tree. When asked why they feel that a tree nursery is important for their school, the teachers immediately spoke about the lack and the unreliability of rain in recent years, and how the communities have had to dig their wells deeper to find water. One outlined how hot years negatively impact local people’s incomes, and how the trees could help to bring back water to the area. The trees are also important to increase benefits from traditional agriculture, by diversifying farmers’ sources of income, he said. Another described how trees decrease carbon dioxide in the air and make the school’s environment more attractive, to make it a good place to learn. What was inherently clear from visiting both Tagelft and Bouchane was the sense of pride that the teachers felt when talking about their schools, and their immense desire to improve the lives of not only their students, but the lives of people in their wider communities too. Their visions for their respective tree projects were inspiring, not just for the number of seedlings that they wished to plant and how well thought through their ideas were, but for the educational activities they wished to conduct, the opportunity that they saw to increase skills, improve incomes and to reverse the environmental degradation in their localities.